Playing sports is a common occurrence during childhood. Since most sports pose a threat for injury, we take the proper precautions to protect our bodies from potential harm. Helmets to protect our heads, pads to protect various bones, but what about our eyes? Most people forget to wear the proper active eyewear that is recommended to protect your eyes from harm. There are about 600,000 ocular injuries every year that come from our indulgence in sports. There are even 49,000 eye injuries that result in a trip to the emergency room every year. That number could be brought down by 90% if people protected their eyes with the proper eyewear. 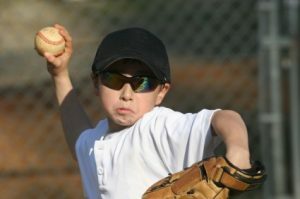 It does not matter the age of the person, the simple fact of the matter is that if they are playing sports they should have some sort of protection for their eyes. Please remember to always take the proper precautions when playing sports. It is very important to educate yourself in eye safety as well as in eye health. Vision is something that everybody should be taking care of on and off the field.